Mixed Use Development (MXD) Trip Generation Study - TADI - Traffic Analysis & Design, INC. Mixed Use Development (MXD) Trip Generation Study - TADI - Traffic Analysis & Design, INC.
TADI's Role: To develop local trip generation rates and linked trip standards for use in future WisDOT traffic studies based on traffic patterns at 16 existing mixed-use developments located throughout all regions in Wisconsin. Several MXD sites were selected within each WisDOT region for a total of sixteen analysis sites. The Wisconsin Department of Transportation (WisDOT) contracted with TADI to conduct a statewide study to develop a local trip generation data set and estimate the true trip generation potential for mixed-use development (MXD) sites throughout the State of Wisconsin. 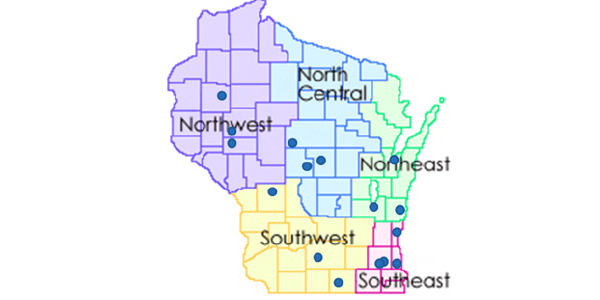 Several MXD sites were selected within each WisDOT region for a total of sixteen analysis sites. At each development site, a field survey was conducted to determine the names and types of land uses for each tenant. Traffic counts were then collected for all vehicular traffic entering and exiting the entire development site for a weekday (Thursday) 24-hour time period and Saturday 24-hour time period. On the same days as the entry counts, door counts were conducted at each individual land use to determine the trip generation for that use. A comparison was made between the door counts and entry counts to determine the linked trips that occurred for the entire MXD site. TADI provided recommendations for collecting off-site development commercial areas and applying them to a percentage range of linked trips for use in new development studies. In addition to linked trips, trip generation tables were developed for each MXD site using actual site trip data and compared to trip generation tables using the Institute of Transportation Engineers (ITE) Trip Generation Manual, 9th Edition trip generation rates. A similar comparison was completed for each individual land use type, and recommendations were made as to whether ITE rates should be used in Wisconsin TIA’s, new local rates should be used, or a combined ITE/local trip rate should be used. After completion of the project, the trip generation data was submitted to ITE for inclusion in the trip rate and equation calculations for the 10th Edition of the ITE Trip Generation Manual.